We were stopping through the CBD today, so I took the opportunity to test out my Ricoh TLS after giving it a bit of a clean up. I also brought along my mobile and the fisheye lens as I wanted to capture something else to document for the day. Being in town there is always a wide range of images, especially with the likes of a fisheye. The first logical choice is to capture the tall skyscrapers towering over oneself and give the distorted image of them closing in on the viewer. Where I strolled through was quite contrasty, and the samsung struggled with the dynamic range to capture the details on the street as well as up in the sky. 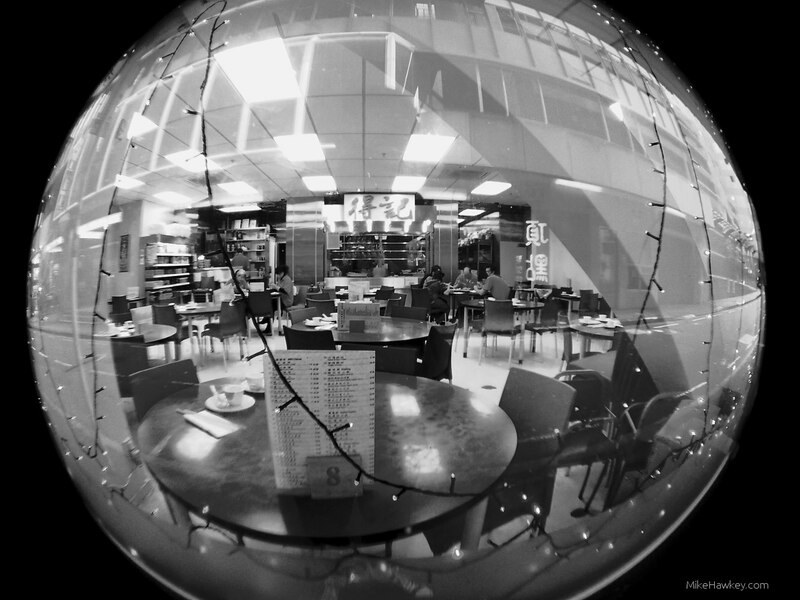 I strolled by a lunch bar where the staff were getting in an early morning meal before opening and composed today’s image ‘Planet Food’ . About a foot out from the window, I like how the reflections outside are captured in the fisheye as we peer into the bowl/planet like image. In post processing, I converted the image to black and white and increased sharpness a little in Gimp.